Our fourty five heritage laying hens are staying comfortable in their winter quarters; we have a limited number of winter eggs available. As the days get longer we will be getting more eggs each day. During winter we are happy to sell eggs by special order off the farm. Feel free to contact us to get on our egg waiting list. We are very excited to be offering our first year of weekly subscription vegetables. If you are interested in becoming a member of our Community Supported Agriculture (CSA) Community you can download a CSA membership form. Please feel free to contact us if you have any questions about CSA Membership! Sadly, we don't have any winter vegetables available for sale this year. After taking an online course from a vegetable grower in a similar climate to ours we are excited to experiment with economical and ecological winter vegetable production next year. Hopefully when you check out our blog in February 2015 we'll have a short list of flavorful winter heart vegetables such as kale, claytonia, mache, and spinach available. 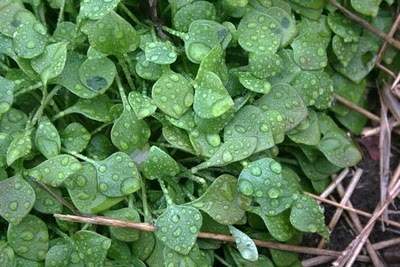 In February 2015 we hope to have claytonia and other hearty winter vegetables for sale.